Respect for nature is respect for the consumer. This is why the products of Grimaldi Nocciola & Co. are the result of a specific attention to the environment, from fruit cultivation to product processing, through an eco-compatible chain run in complete autonomy. The nut plantation takes place on a field of about 25 hectares on the edge of the protected area of the Monti Picentini Regional Park, in the Province of Salerno, without using fungicides, herbicides and chemical fertilizers. Here plantations are irrigated by natural water springs, in uncontaminated environment. 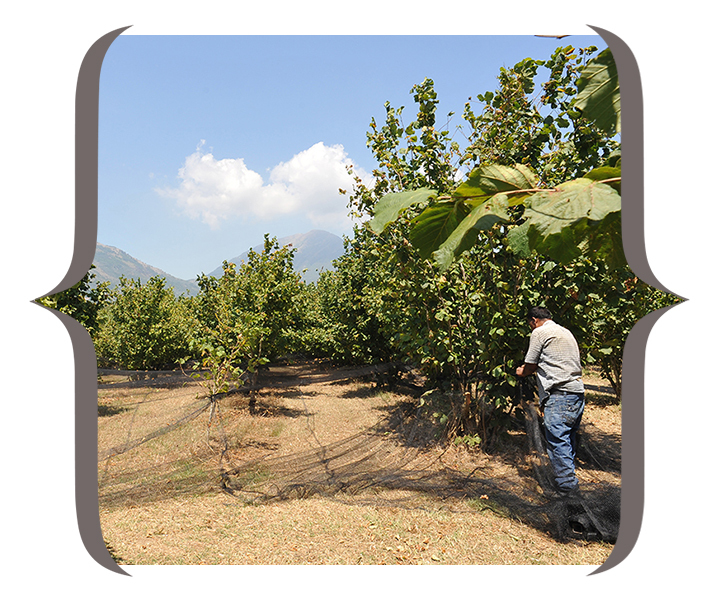 For the harvesting of walnuts and hazelnuts, we use nets placed at a height of 50/70 centimeters from the ground; This way we prevent contact of the single fruits with the soil and preserve their integrity. Successively, fruits are sun-dried on metal nets to provide the adequate ventilation. At this point the product is hand-picked and packed without the use of additives and preservatives. The consumer can taste a fresh and tasty genuine and nourishing product. As natural as any action we take.